There's no proof other than my say-so, but back in the day I got a score of 250,000 on the original munchman before I got tired of playing. That is the one where you eat the dots like in Pacman instead of laying down a chain. If the hoonos behave the same in the released version then it should not be to hard to beat the score above or even my score. Here's how: As the level goes up the hoonos become less random in their behavior. They seek you out more aggressively until you eat a power dot, or Texas dot as the case may be. Then they try harder to avoid you. After level 5 or so, forget about trying to score points by eating the hoonos. When a level starts clear out as many dots (lay as much chain) as you can while they converge on you. Then eat the power dot and continue eating dots (laying down chain) but avoid eating any hoonos. They will make their way to the opposite corner as long as you are energized. Then go over to the next power dot (texas) and lay down as much chain as you can until they converge on you. Eat the power dot and repeat the above for the four corners of the board. The action is very fast at the higher levels but as long as your joysticks let you turn the way you want in the maze, you will improve your score dramatically. I expect to see some very high scores in the next few days. I'll take the embarrassment to set the lowest high score, perhaps tomorrow a better try! As the level goes up the hoonos become less random in their behavior. They seek you out more aggressively until you eat a power dot, or Texas dot as the case may be. Yes, you seem to be right. If you watch my video in the last rounds, I was able to catch all four of them in a row. This never happens in earlier rounds. Although the Hoonos get faster, Munchman also gets faster in normal and hunting speed, so it could well be that the winning strategy is, as you said, not to hunt the Hoonos but to lay the tracks as fast as possible. I just tried the last level of my play again (with Shift-838) and tried as you said, and finished it with only one Munchman lost. However, you must not run out of Texas points with too many missing tracks. Winner picks the next game. Hint hint. the munchman on my gamescart is the dots version, that kosher? I just noticed that MunchMan is on both GAMECART4 AND GAMECART5, but they are different. One is ©1981 and is on CART4 and when you press any key the mouth comes down on the title screen and this is more like PacMan where you eat the dots. The other is on CART5 is ©1982 and this one is where you lay down the chainlink. I never saw the 1981 version. All else looks the same. So this begs the question for this topic is besides the eating dots or laying chains is either one easier or harder? I believe the one we are going for top score is the laying the chain version. I think for the sake of continuity, we should all uae the same version. If you don't have a physical cart, might be best to use the emulated version of the chains Munchman. I just put this one together. TIXELS Play for the world in REAL 2D! Honestly until recently I did not know what Hoonos were and had to look it up. 250,000 wow! (I am installing my real iron now to see how far we come). 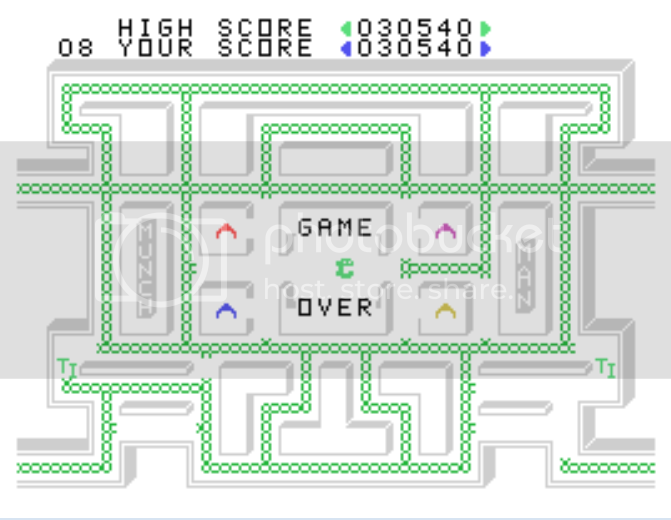 But I was wondering who wrote this: "In level 20, 40, and 60, the maze is invisible and there are no chains"
Just played the real-iron version (silver/black 1981), New high score 103080 with a Suzo The Arcade Joystick. need to get a FPGA18A. 103,080 is the new score to beat, looks like! Nice score, buddy... You're a machine! is any MunchWoman out there ? I am sure someone can hack a Ms. Munchman if you'd like. Equipment: Beige QI /4A and Suzo The Arcade Joystick. 153,840!!!!!! Geez Louise, man, that's smokin'! WOW. I can barely hit 50k! Maybe I can chalk that up to my TI pain sticks! My best so far using keyboard. BTW, we should vote for the game of the next month, not have it proposed by the winner. This is more democratic. Tursi, I have noticed a problem with the arrow key usage on my system... Not sure if it is Classic99 or what, but sometimes, when starting a level, MM freezes up when I hit a wall while the rest of the game continues. I have to click off of the window (pausing when inactive) and then click back on the window to restart the stick emulation. Ever seen this before? I thought it was just me, same thing happened to me last night, I would like to say it stopped me getting through 200,000 points - but I would be exagerating to the power of 10. I almost doubled my score. In two days I'll have the highest score. Edited by Opry99er, Fri Aug 14, 2015 2:16 PM.